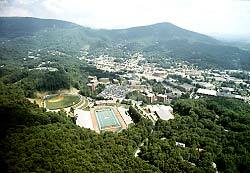 ASU Chancellor Ken Peacock announced this week that Appalachian State has purchased the entire town of Boone. "We needed room to expand, plus this gives us more flood plain to build in." The closing price will be approximately $1 billion and will be financed by student fees. "An added benefit will be that it will end the historic town/gown problem since, well, we will be the town." Photo by Marie Freeman. Used with permission. ASU will not be outdone by New York's Gates art done by Christo. Passersby walking above the CAP building may have thought that the series of plastic barriers was just for abatement of erosion caused by students taking a shortcut, but it is actually an outdoor sculpture. 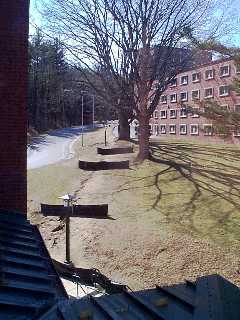 Titled "Gaits," it both "creates a feeling of a series of black impediments to progress in life" as well as slows the gaits of students coming down from the dorms. While the NYC piece was done by Christo and Jeanne-Claude,the ASU piece was done by Kristo, the Discount Artist, and Clod Robbings. Vice Chancellor of Campus Constriction, Clod Robbings, said that it further delays the expensive construction of a sidewalk. "We cannot have a sidewalk that actually goes where people walk," he said. "We must continue to try to force students to walk where we want them to walk." The College of Arts and Sciences has created a new layer of bureaucracy between faculty writing grant proposals and the funding agencies. "We were worried that the Graduate School's Research and Grants office was not doing enough to slow the process," said Grant Holdup, the new grants coordinator. "Plus, we want more interdisciplinary grant proposals, whether the faculty want to write them or not." Asked about his experience in getting grants he said "I've read about getting them, so I know how to slow down the process." Faculty and staff recently received a mysterious email with the subject line "Secual Assaults." The crack staff at the Seen have solved the mystery after noting the simultaneous appearance of religious tracts left in the CAP science building. The email's subject line was supposed to read "Secular Assaults," in reference to the spreading of left-wing secular humanism on campus, especially among the heathen science faculty. The University has contracted with Dr. G. C. Jackson to combat this trend by spreading his pamphlets in which he explains all science in terms of creationism. And, gosh, doesn't that periodic table he is standing in front of give him that air of scientific authority?